The City of Fairfax IAFF L2702 has been participating in Movember since 2010. This started with a few members of our department attempting to grow moustaches with the goal of raising awareness for men’s health. Every year our member participation has grown higher and with that your community support has also grown. But, we felt like we needed to do more than just raise awareness. In 2013, we started our annual “Moustache Bash” which is a fundraising event aimed specifically at raising awareness and funds to support and treat those affected by men’s health related diseases. To date, we have been able to raise $1130 for the cause with the support of our members, friends, and community. On behalf of all the L2702’s members, we would like to thank you all for your continued support and welcome you to join your fire department in attempting to grow a moustache this “Movember”. 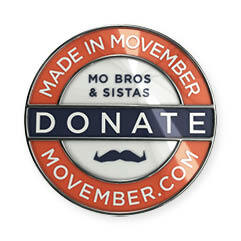 The Movember Foundation is the leading global organization committed to changing the face of men's health. They achieve this by challenging men to grow moustaches during Movember (the month formerly known as November) to spark conversation and raise funds and awareness for men's health issues, specifically prostate cancer, testicular cancer and mental health problems. The Movember community has raised over $550 million to date and funded over 800 programs in 21 countries. This work is saving and improving the lives of men affected by prostate cancer, testicular cancer and mental health problems. Why is Movember important to firefighters? The Movember Foundation is close to the heart of a lot of firefighters because it striving to address some serious issues currently plaguing the fire service. Cancer, alongside heart disease, has been a leading cause of death in the fire service, specifically of our retired brethren. Although Movember specifically attempts to address men’s cancer, we believe any strives forward in the battle against cancer will lead to better understanding and treatment of all cancers. In addition to cancer, mental health has become a key issue needing to be addressed within the fire service. We have seen a recent increase in mental disorders and suicides of our members in the public safety profession. The IAFF and L2702 have made it a priority to assist those in their attempt to research and address mental health disorders affecting firefighters. In 2013, this truly hit home for our local as one of our most respected members was diagnosed and lost his battle with job-related prostate cancer.